Weighing about 142gram and measuring an overall thickness of approximately 1.06 inches, Sanyo has rolled out what it claims to be the “world’s smallest and lightest” full HD camcorder, namely Xacti VPC-CS1. This super slim and ultra portable pocket camcorder sports a 10x zoom to a 38-mm wide angle lens and is able to shoot full quality HD 1920 x 1080 pixel videos and 8-megapixel still photos. The video recording is in MPEG-4 AVC / H.264 format, a pretty common and easy to use format on the computer and internet environment. There is also a variety of sound recording options offered for users to capture the best audio quality. Also featured alongside Sanyo Xacti VPC-CS1 are the Digital Image Stabilizer and Face Chaser functions for better image quality. 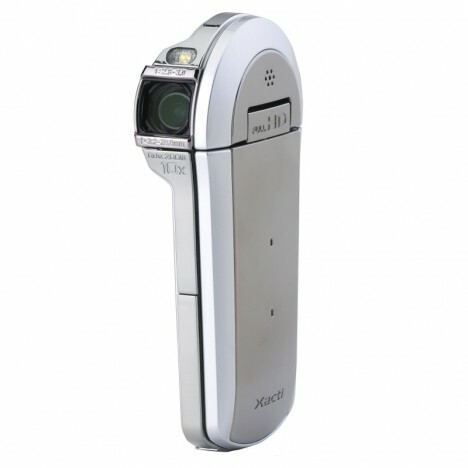 Xacti VPC-CS1 supports both Eye-Fi cards and SDXC memory card. Eye-Fi cards helps in simplifying the wireless setup and speeding up content transfer whereas the SDXC memory card offers very high access speeds and storage capacities. Priced at an estimated $299.99, Sanyo Xacti VPC-CS1 should be useful for shutterbugs who don’t like bulky equipment but prefer a convenient pocket camcorder which is always ready for any interesting shots.